The X-Men slot machine was part of the Marvel progressive jackpot series of games from Playtech that has now been discontinued due to the termination of the deal from Marvel. If you enjoyed the game play style of the Marvel series you can now play the same mobile slot functionality in the Age of the Gods series, so we recommend checking those out at one of the Playtech casinos we list on MCM. If you wish you can still read about the game in The X-Men slot review below. One of the first Marvel-inspired slots to hit our screens, Playtech’s X-Men slot still holds its status as a firm fan favourite to this day thanks to an exceptionally generous bonus round and – as with all slots in the franchise – its ties to the Marvel Multi-Level Mystery Progressive Jackpot. While graphically the game is admittedly starting to show its age, it’s easy to see why the X-Men slot remains popular with video slot fans. The game features 25 adjustable paylines and coin sizes from $0.01 to $25, meaning it can be played with the max number of lines enabled from as little as $0.25 a spin. For that small investment, you stand the chance of landing yourself not only a regular jackpot of 10,000x your stake for finding a wild symbol on each of the game’s five reels, but also the mystery progressive jackpot prize, which is awarded at random at any stake even during non-winning spins. Before getting onto the bonus feature in the X-Men slot, there is one useful little extra that is worth mentioning purely because of how frequently it pops up – and that is the fact that you win 5x your total bet whenever any combination of hero symbols form an “X” on the game’s central three reels. This can significantly boost your winnings while you’re waiting for that all-important bonus round, which is triggered whenever three or more X-Men scatter symbols appear anywhere on the reels. When triggered, this will launch a feature that awards a potentially unlimited number of free spins. Beginning in Heroes mode, only the good guys, wilds and Magneto will appear on the reels and you’ll keep getting free spins until the last of that trio arrives on the central reel. Once that happens, the game will switch into Villain mode and a countdown of eight spins will begin. Wins are still awarded as normal, but unless you find Professor Xavier on the central reel before the countdown ends, the game is over. Manage to achieve this, however, and Heroes mode resumes as the process repeats. 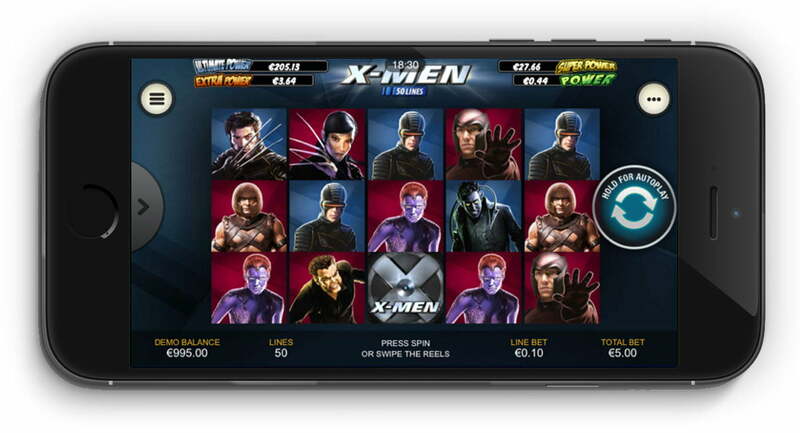 While the graphics may be starting to show their years, the X-Men slot is still an incredibly playable game that is both suitable for mobile casinos players on smaller bankrolls and rewarding enough to keep high rollers hooked. Like the X-Men slot review? Check out these as well…..